The American Electric Power (AEP) Clinch River power plant is located near Cleveland, VA which is approximately 500 km west of Richmond, VA. It generates electricity with three 237 MW coal-fired units. Owned and operated by AEP's Appalachian Power Company subsidiary, the plant started operating in 1958. Since 2004, AEP has invested more than $5 billion to retrofit the environmental controls at a number of its coal-fired power plants. Of this sum, about $2 billion has been allocated to this and other plants run by the Appalachian Power Company. This aims to reduce the emission of nitrogen oxide (NOx) and sulfur dioxide (SO2) from the burning of coal to generate electricity. The TDLS detect unit in a fly ash-filled environment. It is noticeably covered with ash. The Clinch River power plant is equipped with selective non-catalyst reduction (SNCR) systems. SNCRs are a refitted post-combustion technology that reduces the amount of NOx released into the atmosphere by injecting an ammonia (NH3) reagent into the flue gas. This induces a chemical reaction that breaks the NOx down into harmless nitrogen and water vapor. Ammonia is a toxic gas and its emission contributes to ozone depletion. Ammonia slip, or the emission of ammonia gas into the atmosphere, can occur due to incomplete mixing of the ammonia reagent with the NOx or the injection of excessive amounts of ammonia. The TDLS launch unit is located outside and is exposed to a wide range of weather conditions. To avoid fines and shutdowns, it is desirable to keep fugitive ammonia emissions at or below the minimum levels mandated by the U.S. Environmental Protection Agency (EPA) and other regulatory bodies. Downstream from the SNCR systems, it is also essential to hold the NH3 below 5 ppm and preferably to 2–3 ppm as this minimizes the formation of ammonium sulfate [(NH4)2SO] and bisulfate (NH4HSO4) on the preheater surfaces. Such deposits are hard to remove with sootblowers. A fouled preheater operates less efficiently and corrodes at a higher rate, leading to higher plant operating costs. In the worst case, the deposits can trap fly ash and cause a pressure drop in the preheater that can lead to a plant shutdown. Additionally, while Clinch River does not sell their fly ash (for drywall, gypsum board, cement, etc. ), some generating plants do, and the ammonia slip can contaminate the fly ash, giving it a strong odor and making it unfit for commercial sales. Excess NH3 can also increase exhaust opacity beyond regulatory limits, resulting in complaints and fines. In 2006, the Clinch River power plant installed nine tunable diode laser (TDL) analyzers to measure ammonia slip from the SNCRs. However, these analyzers, which came from another vendor, did not provide sufficient availability to ensure that the compliance monitoring requirements could always be met. High maintenance costs and the accuracy of their readings were also operational concerns. After conducting a months-long evaluation of several vendors' TDL analyzers mounted on-site, AEP and Clinch River decided to install nine Yokogawa TDLS200 TruePeak analyzers to improve its monitoring of ammonia slip. Since installation, the TDLS200s have been working properly. Clinch River now finds it a much simpler task to meet and comply with the EPA's stringent NH3 regulations. At the same time, the analyzers are operating more efficiently. The TDLS200 TruePeak analyzer measures the concentration of a gas using laser absorption spectroscopy. Unlike many continuous emissions monitoring system (CEMS) analyzers, this does not require preconditioning of the gas. The TDLS200 is thus well suited for tough applications that require the capability to make in-situ measurements with a fast response. Thanks to having a more powerful laser light source than competing products, the TDLS200 is able to measure ammonia slip in the flue gas of a coal-fired power plant. This application is generally known to be extremely challenging for analyzers of this type because of the inevitable high dust (fly ash) loading. To ensure accurate measurements when dealing with low ammonia concentrations, a long optical path length (OPL) is required. 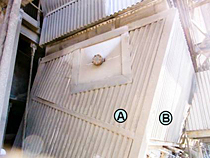 This requirement for a long beam path ruled out the measurement of NH3 at an angle that intersects two adjoining sides of a flue gas duct (as shown by points A and B in the photo). To measure NH3 across the entire width of a flue gas duct, insertion tubes were installed on both the launch and detect units, as shown in the following figure. This shortens the portion of the OPL that is exposed to particulate-laden process gases, which can lead to decreased measurement accuracy. The insertion tubes are air-purged to keep the laser windows clean and prevent the entry of fly ash that can cause additional signal degradation and maintenance issues. Yokogawa TDLS200 TruePeak analyzers have improved the accuracy of AEP's ammonia slip monitoring and have helped to ensure that this company complies with the EPA's stringent regulations on the release of NH3 into the environment. The ammonia content is accurately measured using sufficient laser transmission thanks to proper installation, air purging, and the powerful laser light source. 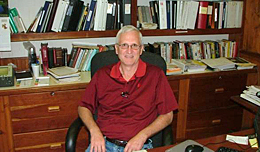 Edwin Shelton, operation superintendent of AEP Clinch River Plant said, "Installing the Yokogawa TDL improved our capability to optimize urea injection for the SNCR. The monitors provided more reliability and accuracy, in a harsh environment, than the previous monitors."